Irish Potato Bread… I was all over this recipe when I found it on Pinterest! Thank you Jo and Sue for a fantastic savory bread recipe that doesn’t have yeast in it! That’s right, no yeast, no proofing and no waiting for rise times. A quick ,fantastic potato bread recipe you can make and enjoy for dinner in no time at all. 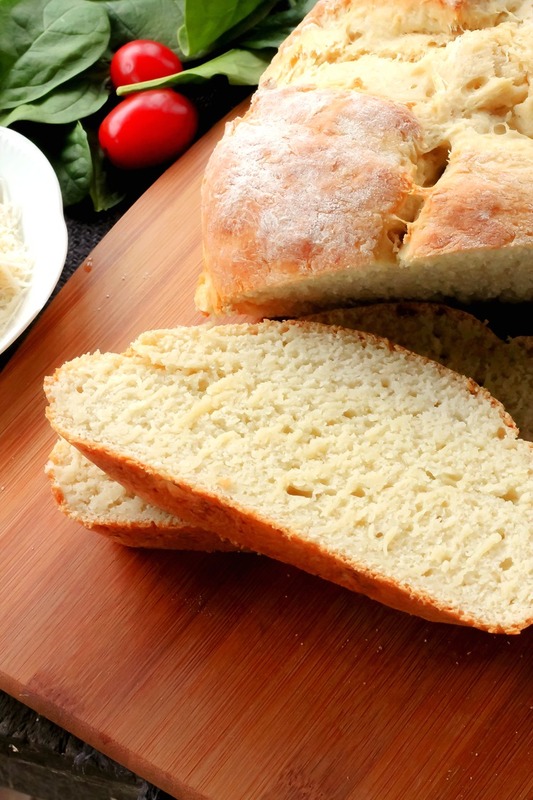 The potato in the bread makes this very soft and moist, it’s also very versatile. I added Parmesan Cheese and a little garlic powder to the batter, check out Jo and Sue’s version made with caraway seeds and chives! This is versatile enough that you can eat it without flavorings or experiment with different spices, cheeses and seeds to make a different bread each time you make it. After the Irish Potato Bread was cooled I sliced a few pieces up for Paul and I to taste. He asked me if I could wrap it up so he could share it with his buddies! There went my bread and a stick of butter! You know he loved it, time to make more. Homemade goodness from our house to yours, ENJOY! 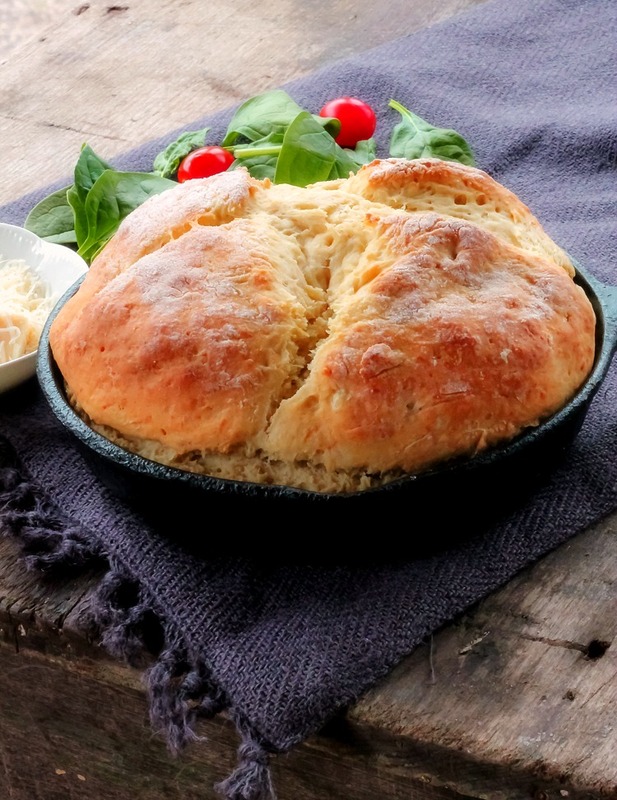 Irish Potato Bread is a delicious savory quick bread that doesn't require yeast! Place the mashed potatoes and raw grated potatoes in a large mixing bowl, whisk together until well combined. Add the egg, egg white, grated Parmesan cheese, garlic powder, milk and oil to the bowl, whisk until completely incorporated. In a separate large bowl, combine the flour, baking powder and salt, stir to combine. Stir the dry ingredients, into the wet ingredients until a soft dough is formed. Lightly flour your counter top, place the soft dough on the floured counter top and kneed 6 -7 times. Gather the dough up and form a ball, place it in an oiled 8 inch cast iron pan. Using a serrated knife (a steak knife worked well) cut an x on the top of the dough. Bake at 375 degrees for 45-55 minutes. It should be golden brown on top. Cool on a wire rack about 10 minutes. Run a butter knife around the edges of the pan to release the bread , remove from pan, place on a cooling rack to cool completely before slicing. All purpose flour? Sorry, but I’m new to baking! Yes Linda, all purpose flour. i love this website . the food are delicious and wonderful. may you send me an email so I can keep connected with you. michele, my email address is malonebunny@gmail.com.You are more than welcome to email me anytime. Do you drain the grated potatoes before adding or do you use the potato water as well? Patti drain the grated potatoes before adding them to the batter. Let me know what you think if you make it! I just had my first slice – it’s really very good! I made a plain version, without the cheese and garlic powder. The next time around, I’ll make the savory version. Thanks for the recipe! I’m so happy you lined it Patti, thank you for taking the time to come back and tell me! Is the calorie count correct?? Over 3000 calories per serving?? The counts have to be incorrect!! Please let me know!! Denise i didn’t put the serving count in the recipe card. That would be for the whole loaf! How do you prepare the pan? The recipe references it but doesn’t tell you how to prepare it. I’m assuming oil it? YES Suzanne, oil the cast iron pan! I just fixed the instructions, thanks for pointing that out! I hope you get to make it! Got this in the oven now but I didn’t drain the grated potatoes. Hope it turns out! Could you fix the recipe to reflect that? I should have read the comments. Thank you. Just fixed it Suzanne, I didn’t even think about draining the potatoes, I grated them right before I added them to the mix! Thank you! Can a regular pan be used,? or does it have to be a cast iron pan? Thank you ever so much for a speedy reply. Honey Irvin, sure you could make an 8 inch baking pan to make it. Great recipe!!! I have some potato flour I wan to use, I was looking for some recipe to use it in and found this delicious bread. Do you think I can substitute some of the all purpose flour with my potato flour and use regular flour for the rest of the measurement?? I think I only have 2 cups or so of potato flour left to use. I will appreciate your reply. Thank you for this recipe!!!! Yesterday I read it. And today I made it! Sooooooo delicious!!!!!!!! I made this bread to replicate something I had for breakfast in Northern Ireland. It’s delicious!!!! I pan fried a slice in butter and it tastes just like I remember. Thanks for the recipe! It helped me figure out the one food item I loved so much on my visit. Awe Anna that’s fantastic! I’m so happy this recipe brought back a great memory of your trip to Ireland! great potato bread! made it last week for my family to go with my nans irish stew recipe and it was perfect. all that dipping and soaking up the goodness on our plates, omg it was so good. even reminded us of back home a little as we currently live in australia. easy and tasty. thanks! Well annabelle you’re making me wish I was sitting at the table with you girl! I’m very happy the bread was the perfect fit for your nans Irish Stew! Thank you for coming back to tell me you made it annabelle. What kind of potatoes do u use? Can I substitute the grated potatoes for more mashed? Lizzy I’ve never made a potato bread that used all grated potatoes. I didn’t make it that way, I followed the recipe. You could try it but I just know what the end result would be. I’ve never used red but I don’t think it really matters. It’s the starch from the potato you want Chelsey. Let me know how it goes if you make the bread. I am making this now but using leftover mashed potatoes. Not sure what will happen. My L\O mash is a really rich one. I’d love to hear how it works out with mashed potatoes Heidi, please come back and tell my what you think. It’s always helpful to other people wanting to make the recipe. Is this a light or dense bread? I would say dense Arleen. It’s a quick bread and doesn’t use any yeast. But it’s a very very good bread. Let me know how it turned out Lynn! The only cast iron pan I own is 14 inches. Does the bread spread out as it cooks or can I mold it into a shape, place it in my cast iron pan, and trust that it wont become a flat mess? What alternate pan can I use? And would their be any problem if you lined the pan with parchment paper to keep it from sticking? Erin the cast iron pan I used was 8 inch. I don’t see why you couldn’t use an 8 inch round cake pan to make it. The cast iron pan is black adds to the heat when baking but if you just check the bread at the end of the baking time with a toothpick to see if its done, you’ll know whether you need to let it bake a little longer. Hi Arleen, I’m not sure what the question is sweetie? Are you asking if you can substitute and ingredient for zest? If so, there isn’t anything in this recipe that has any kind of fruit flavor in it. I’d use an 8 inch baking pan Deb. You may have to bake it a little long. The black cast iron holds heat very well which I would guess makes it bake quicker. But I would think an 8 inch metal pan would do just fine. Just check with a toothpick for doneness at the recipe baking time and give it more time if needed. I made this yesterday using self-rising flour (omitting baking powder and salt) and instead of garlic powder and vegetable oil, I used roasted garlic infused olive oil. It turned out fantastic! I think to get it to perfection the next time I am going to use rosemary. Love that this is a quick bread. Thanks for sharing this recipe. Wonderful JB! What a way to make it yours, I bet it was delicious! Oh good grief I wish I was there, warm bread from the oven is my weakness, enjoy!